It seems to me that it would be much better for me to do things with Scampy instead of staying inside Twayler watching movies all day. So, this morning I'm going to go to a park here in Apple Valley to see how that goes. Baby Boid is going too. Horseman's Park in Apple Valley is a lovely park. Lots of trees for shade. Picnic tables. And even 120 volt electric power! Boid stated that he did not want to go to the park! He was having too much fun playing around with his mirror. This mirror is suspended by a rubber band. 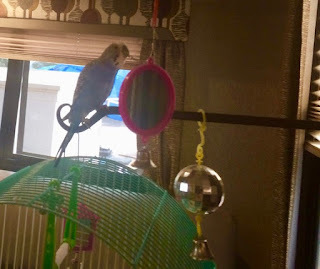 Boid likes to make the mirror bounce! Do that George....you and Boid will enjoy some fresh air. Have a fun day. I'm doing the best I can. It's a challenge for me. George, Boid thinks he sees another Boid in that mirror and attempts to communicate and play with him, just like a small baby. Boid is a very happy bird. He loves to listen to music which I play for him on my iPhone. I love your stories about Boid. Boid likes to fly around the room and explore. He will fly to me when I am on my La-Z-Boy recliner. But only when he wants to. He does not let me take him on my finger, and move him around. Maybe in the future Boid will be finger trained. I love your stories about getting out with Scampy. What a cool life! Yes, getting out with Scampy is good for me too! When I am out someplace and need a toilet, I have one. Very important to be timely at my age. Don't want any accidents!